A team of chefs from North East Scotland College have made it through to the final of a prestigious competition. The side consisting of Jack Morrison, Zoe Donald and Lucy Gordon beat off stiff competition to make the last round of the Country Range Student Chef Challenge. They will now battle it out against nine other colleges from around the country when they travel to Hotelympia in London next month. During the final they will have to cook their three course menu in 90 minutes in front of a live audience. Their set piece includes Langoustine Bisque, Lamb Loin and Empress Rice. 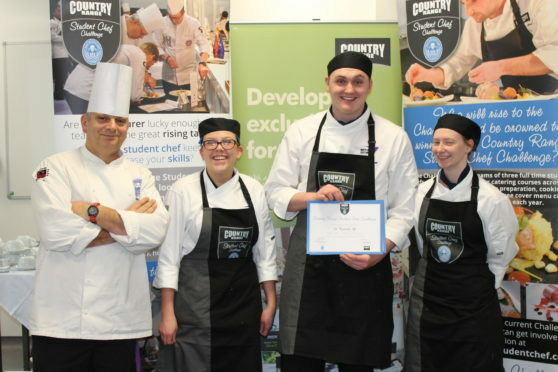 The annual competition has been running for 24 years and has become the pinnacle for hospitality students looking to develop skills and show off their culinary prowess and creativity. Those on the winning team will collect a set of three Flint and Flame knives, a trip to the 2018 Universal Cookery and Food Festival in September and will also be treated to a night’s accommodation at the Simpsons restaurant in Kenilworth. Emma Holden, organiser of the competition, said the team from North East Scotland College”thoroughly deserve” to be in the final. She said: “It was an incredible start to the semi-finals with some unbelievable technique, team work and dishes on display. “A huge congratulations has to go to all the teams but North East Scotland College and South East Regional College thoroughly deserve to make it through to the final after each produced three amazing dishes.